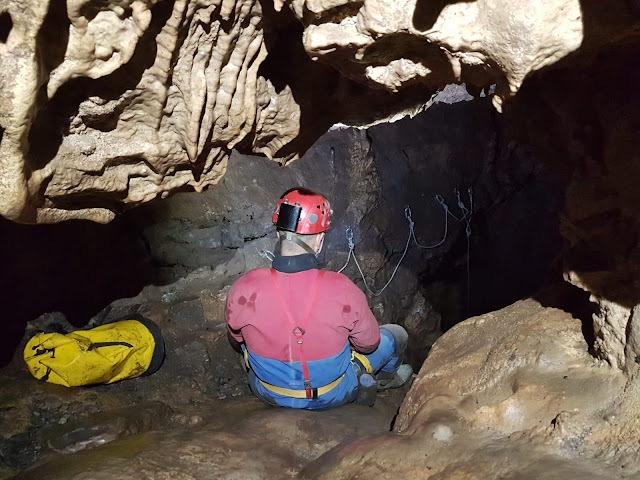 Continuing our our recent trend of visiting caves new to us we decided on something a little out of the norm for the Mendips with an SRT trip in Rhino rift. Our weekend begun in the Hunters Inn where we met up with Mike, Paulina, Tash and Kay who had spent the day In Reservoir Hole. We proceeded to sink many pints between us and eventually stumbled back to the Shepton Hut where Chris and Jim had a camp fire awaiting. After warming by the fire and chatting for a bit, not to mention pinching Kays chocolate stash, we eventually headed off to bed. The next morning the gang headed to the Priddy farm shop whilst Jess and I made a slight divert to the Wessex to collect the key before joining them and Keith for the usual 5* breakfast experience. We said our goodbyes to Kay and Tash who were off to Shatter cave for a photographic trip and Paulina, Mike, Keith, Jess and Myself headed off for our own adventure. 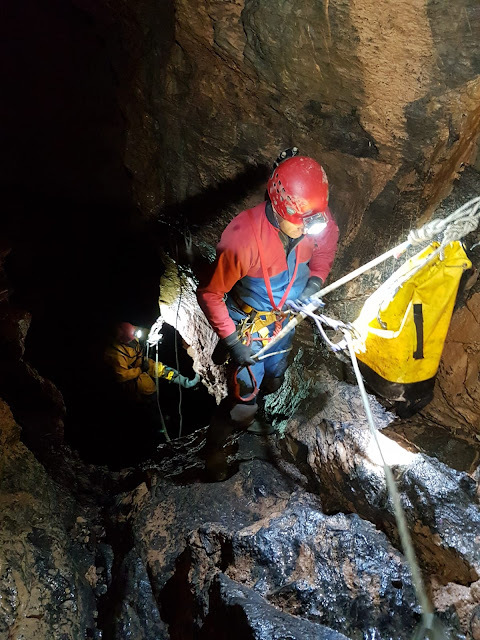 We were quickly at the cave entrance and unlocking the gate, Mike and I went on to begin the rigging whilst the others held back with Keith to play with some video. The traverse at the first pitch was quickly rigged and I began my descent to a single bolt after around 15m, as the result of a single point failure would have been too large a shock load I put in a deviation at this point and continued on to wait for Mike to bring the second bag forward at the next pitch head. Here the first y hang swings around a corner and is quickly followed by a hanging re-belay to a rock filled ledge above the third pitch. A call came down to let us know that Keith was finished playing with video and heading out and we were soon joined by Jess. I had begun to rig on the right hand wall, but quickly realised the better route was a traverse on the left wall to a further hanging re-belay which is soon followed by an awkward deviation. Paulina came next and spent a while figuring out the best way to tackle the deviation and was then followed by Jess. I went for a poke around and down an awkward hand line assisted climb to take a look at the continuing rift, before heading back. Mike decided he'd had enough fun for one day and so we all headed back up with me de-rigging as we went. Back on the surface we celebrated with mince pies before heading back to return the key and home to wash rope!